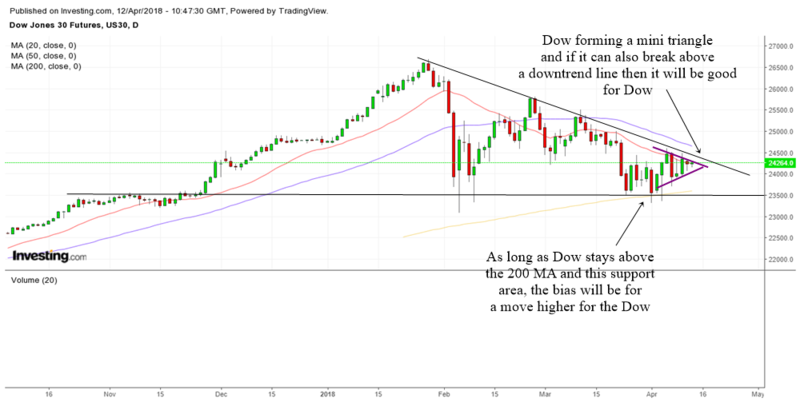 The Dow and the general markets are still on the brink of breaking a daily downtrend line. It might also be forming a mini triangle in the daily charts as the markets fight it out between the bulls and the bears. Dow is still trying to decide where it wants to go. It is surprising how resilient Dow is amidst the trade wars and so many tensions. Right now, the support area and the 200 MA will be an important focus area. I believe that as long as Dow stays above the 200 MA and also the support area, then the bias will be for a move higher for the Dow. If Dow breaks below this area, then we will have more selling. Notice how Dow is also forming a mini triangle. It really is trying to fight it out between the bulls and the bears. A break above the mini triangle as well as the down trend line will be good for the bulls.